In a city devastated by plague, Araby Worth is one of the fortunate citizens who owns a mask to wear whenever she is outside. In fact, it was her scientist father who designed the protective masks that only the wealthy can afford. Though Araby lives in comfort amid the ruin of the city, every day is a struggle for her. She blames herself for a family tragedy and spends her nights seeking to forget everything at the Debauchery Club. Araby may go there to lose herself, but being in the company of Will, one of the club’s employees, and Elliott, the well-to-do nephew of the club’s owner, begins to have a surprising effect. For the first time in a long time, Araby may have found some purpose in her life. I absolutely love Edgar Allan Poe’s short stories, so I was extremely excited to read Bethany Griffin’s retelling of Poe’s haunting tale. Griffin brilliantly matches the dark, ominous tone of Poe’s original, while at the same time crafting her own unique take on the story. Add a gothic/steampunk setting and some morally ambiguous characters, and you have a compelling novel that takes some surprising turns along the way. This is one of the darkest YA novels that I’ve read, but the foreboding atmosphere perfectly suits a Poe retelling. The Weeping Sickness has decimated the population, and you can just sense the miasma of death that hangs over the city. Its ruler, Prince Prospero, has shut himself up in the safety of his castle, and he also controls the production of the masks that could save the lives of his citizens. Instead, he allows the city to continue to crumble and the body count to rise, especially among the poor, who cannot afford to buy masks. The world of this book is very grim, indeed, and Griffin does an amazing job building it. Araby is not your typical YA heroine. She holds herself responsible for the death of her twin brother, Finn, and uses drugs and alcohol as a means of escape. Araby’s hopelessness is heartbreaking to behold, and I couldn’t help but feel sorry for her. She’s not one to whine about things, either; she’ll punish herself first before blaming others, and Araby does just that by vowing not to enjoy anything that Finn will never experience, including falling in love. Her promise becomes more difficult to keep, however, as she becomes better acquainted with Will, who works at the club where Araby goes for her nightly trip to oblivion, and Elliott, a wealthy young man who just might be plotting to undermine his uncle, Prince Prospero. Reading George R. R. Martin’s A Song of Ice and Fire series has really given me an appreciation for gray characters, the ones whose motives and intentions are completely inscrutable. 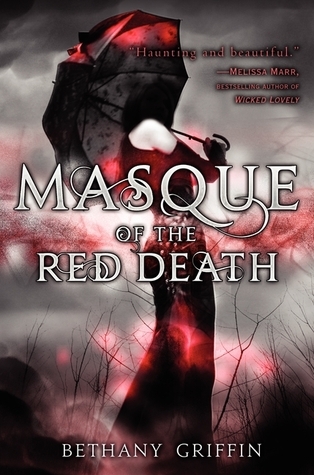 While reading Masque of the Red Death, I kept alternating between labeling Elliott an arrogant jerk and believing that he had some good in him. He wants to make the masks available to everyone and enlists Araby’s help in obtaining her father’s design plans. Noble idea, right? But Elliott also possesses a less gentlemanly side, as illustrated by the following conversation with Araby: “And I’m falling in love with you,” he whispers. “But I would throw you in the water and watch crocodiles tear you to bits, if I thought that doing so would accomplish my goals. Do. Not. Trust. Anyone. Especially me.” (Chapter 14) You sure know how to charm the ladies, Elliott! Yet I could not help liking this guy. A lot. I love complex, unpredictable characters who constantly surprise me, and Elliott certainly is not the type of person who likes to tip his hand. Will, the other figure in what looks to be a developing love triangle, seemed to be a bit easier to read than Elliott. I admired Will for being the sole caretaker of his younger siblings, Henry and Elise; they lost their parents to the plague. Will also appears to be genuinely concerned about Araby. Although he takes some eyebrow-raising action toward the end of the book, he has a very good reason for doing so, and it didn’t lower my opinion of him. It’ll be interesting to see how this triangle unfolds, especially considering Araby’s vow. It did take me a little while to get into this book, but as I continued reading, I found myself increasingly enjoying it. The pacing is more of a slow and steady type than a gallop to the final page, but your patience is rewarded with some thrilling scenes in the last few chapters. Be warned, though, that a lot of matters remain unsettled, meaning that you’ll have to wait for the sequel, Dance of the Red Death, to see if your questions are answered. I look forward to reading more of this Poe-inspired story, which this Poe fan enthusiastically recommends. This is a must-read for anyone who likes Edgar Allan Poe. Even if you haven’t read any of his works but enjoy novels with very dark settings, then this might be for you. And of course I urge anyone who hasn’t read Poe’s original story to go ahead and check it out. Well, I dont know anyone who doesnt actually like Poe's works!! I really have been wanting to find a good dark novel for a while, so this sounds exactly what Im looking for. It'd be an awesome Halloween read! I'd love to hear what you think of it! I am a big Poe fan and have been meaning to get to this one ~ you've made me push it farther up the TBR list! Great review ~ I too love a good complex character!! I hope you enjoy it, Ali! Poe's been one of my favorite authors since, maybe sixth grade, and this is a great take on his classic story. Elliott is definitely a sketchy guy, but that's why I like him so much. :) I'll have to check out the Nevermore series- I love anything Poe-related. I didn't like the characters as much but I did love the setting! I wanted to go and get debauched in that club and play dress up LOL. Looking forward to book 2! The setting was fantastic- very Poe-esque! I LOVE the cover of the sequel and can't wait to read it, either! I'm happy to hear that you'll be adding this to your bookshelf, Micheline! I think I might end up owning a copy of this, too, because I'm really eager to read the sequel, and I'm not sure that I'm willing to wait for it to become available at the library this time. So if I buy the second book, then obviously I have to buy the first one, lol.